Star Alliance is the world’s largest (and best) airline alliance. You can virtually travel to every single destination in the world on a Star Alliance airline – the alliance serves the most destinations in the world. Many passengers fly with Star Alliance as the alliance offers a smooth transition between carriers, including baggage checking to your final destination, seat assignments on all carriers, creative flight routings, etc. As mentioned in Redeeming Miles from Airline X on Airline X’s Partners, you can redeem ANY Star Alliance miles for travel on ANY Star Alliance airline as long as there is award availability. You can redeem United Airlines miles for travel on Lufthansa, you can redeem Turkish Airlines miles for travel on Singapore Airlines, etc. Redeem your miles from any airline in that alliance for travel on other airlines in that same alliance. 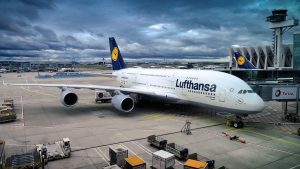 Any miles you may have with any of these airlines will allow you to book an award ticket on any of the airlines in Star Alliance, if there is award availability. Searching for award space on Star Alliance is incredibly easy due to United Airlines’ website – United.com which displays ALL Star Alliance airlines and their available award flights. If you see an available flight on United’s website, you can generally book that flight with any Star Alliance miles – you would just have to call your frequent flyer program and simply provide them the available flights you found on United’s website. When searching for award flights, always search one-way at a time. There is often more availability shown when searching just one direction instead of round-trip. To begin the search, make sure you select “one-way” and proceed to fill out the form with your desired routes, dates, number of passengers, etc. Make sure you check the box marked “search for award travel“. The next page will display flight results with many combinations, including a calendar which will show you the lowest price in miles. You can easily switch between dates on the calendar to find the best available flights for the lowest price. Above the calendar, you have a few options including the ability to switch between results for Economy/Business/First Class, the ability to show only nonstop flights, and also an option to open a 30 day calendar which shows award availability for the whole month. The details section of a certain flight combination is incredibly useful as you can check the exact flight times, connection times, operating airlines, aircraft types, etc. United Airlines offers two award flight “types” – Saver Awards and Everyday Awards. You will notice (above in the image, for example), that there are two options for this flight – a Saver Award in Economy Class and Business Class, and an Everyday Award in Business Class. Saver Awards are the award flight types you should be booking – they are the lowest cost available in miles, however have fewer seats available. 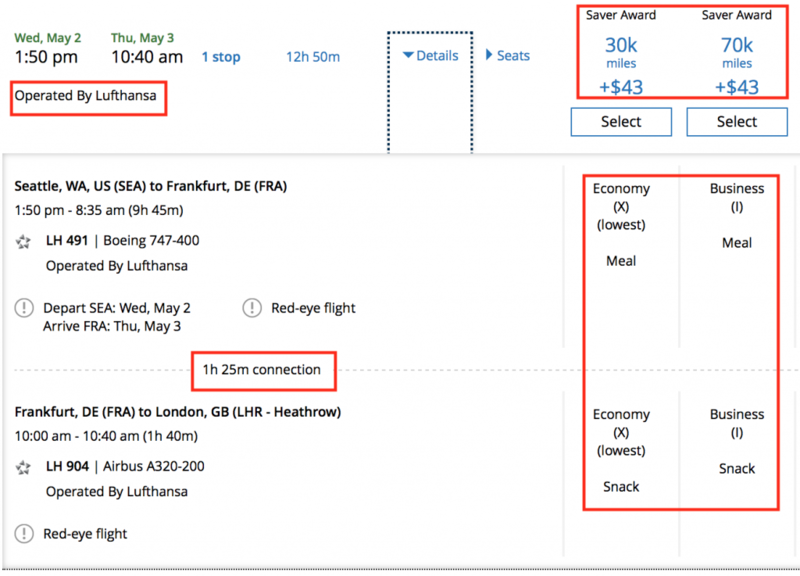 You can only book Saver Awards using other Star Alliance miles. 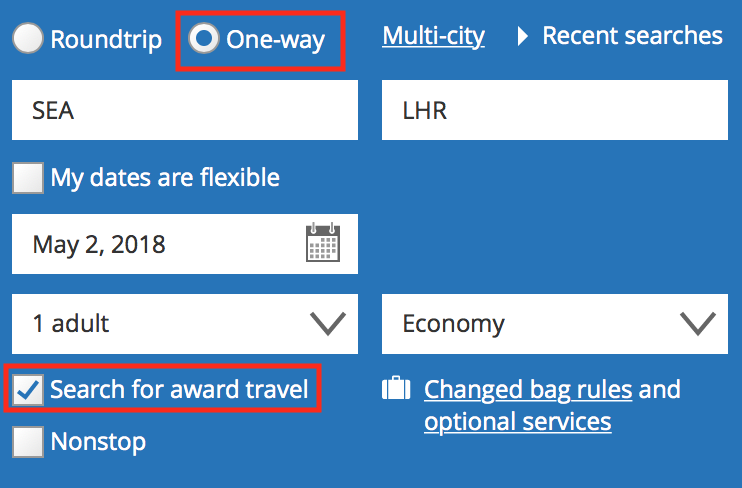 Therefore if you are planning to use other miles but would like to use United.com to find flights, make sure you find Saver Awards as only those will be bookable using other Star Alliance miles. If there is space in either X, I, or O classes (as designated on the award availability), you can book these flights using any Star Alliance miles. Everyday Awards are only available if you are using United miles. There will always be more Everyday Awards flights as those are significantly more expensive and therefore there will be more seats available using miles. You should never be booking Everyday Awards as they are a terrible use of miles. Furthermore, Everyday Awards are only available on United Airlines flights – not on Star Alliance flights. If you are using United miles to book your desired flights, you can simply “select” your desired flight and proceed with the booking process. One you have found flights, you can transfer Chase Ultimate Rewards, for example, and continue with the booking process. If you are using United.com only to locate award availability, once you have found your desired flights, you will want to call your Star Alliance frequent flyer program to book the flights you found, at the Saver Award level. You may not necessarily have to call – you might even be able to book online with your desired Star Alliance frequent flyer program. If booking with another program, that program’s rules and award prices will apply – not United’s. For example, this same flight combination as shown above will cost 30k miles with both United and Air Canada, however Air Canada charges just 55k miles for Business Class, while United charges 70k miles. The taxes/fees may also differ – Air Canada imposes fuel surcharges while United doesn’t. While the cash portion of the ticket will cost significantly less when booking through United, you will pay more miles. When booking through Air Canada, you will pay less miles but more money in taxes/fees. United’s website is the best way to find Star Alliance award availability. However, it is important to remember that while the same flights should be available to other Star Alliance airlines (Saver Awards), the cost will be different and the rules of the ticket will apply from whichever frequent flyer program you are using. Furthermore, it is important to note that all airlines have different routing rules – for example, United may show you a certain flight combination and while United will let you book this combination using their miles, Lufthansa, for example may have different rules and may not let you book the same routing. It is important to check the award rules with your desired frequent flyer program. As always, if you have any questions, please post them below!